I will attending the ASPO-USA conference in Sacramento in the coming week and traveling in California thereafter. I expect to post again on October 5. In the meantime, my September column on Scitizen should be appearing shortly and I will post the teaser on my blog when it does. My post this week will be short and early as I am on my way to the ASPO-USA conference. Worldwide inflation is driven in part by the increasing fraction of our fossil fuels that have to be used in getting more fossil and other fuels. If the money circulating is the same or increasing, and if the quality [of] energy reaching society for its general work is less because so much energy has to go immediately into the energy-getting process, then the real work to society per unit [of] money circulated is less. Money buys less real work of other types and thus money is worth less. Because the economy and total energy utilization are still expanding, we are misled to think the total value is expanding and we allow more money to circulate which makes the money-to-work ratio even larger. I think what we are seeing is the convergence of colossal financial mismanagement with energy stringency. Not surprisingly the authorities think that only money is the problem, i.e., there isn't enough of it available to fill the holes created by the disappearing value of various types of financial instruments. But if energy stringency is also part of the problem, then merely filling the financial voids with new money will only add fuel to the already potent inflationary mix which I fear is about to ignite. In saying this, I offer no solution to the problem as stated. The real solution is much harder: deep cuts in energy use, rapid investment in and deployment of alternatives, reworking the infrastructure including agriculture for a low energy society. I'm under no illusion about whether such proposals will be made at the highest levels since there seems to be little awareness of our energy predicament. I title this piece, "The Last Bailout," because if we are at peak, then financial bailouts will do little to help us. In the past when society had rising energy supplies with large energy profit ratios, these financial bailouts could avert disastrous consequences. They would allow the economy to regain its equilibrium and await the next sustained upturn. But, what if there is no next sustained upturn? If that turns out to be the case, then even if additional bailouts take place after today, they will all ultimately be lumped together into one, namely, the last bailout. And, the last bailout will of necessity fail to work as advertised. What does that mean? First, a quick review. It takes energy to get energy. 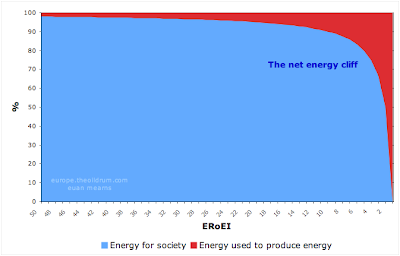 EROI is a measurement of how efficient a process, an enterprise or a society is in obtaining energy. EROI is usually expressed in a ratio, say, 20 to 1. That would mean that the process being studied produced 20 units of energy for every one unit expended. As it turns out, that's about what conventional crude oil returns. But what about nuclear? Hall and his students once again attempted to calculate the EROI. Others have made claims of 1.86 to 1 to 93 to 1. The very high estimates appear to leave out many steps in the nuclear fuel and construction cycle. Some contend that the EROI of nuclear is favorable enough--perhaps 11 to 1--to argue for expansion of nuclear power. But, if one takes into account all the energy that will be expended over time storing nuclear waste and guarding the waste and the mothballed nuclear plants in the future, the EROI could drop below 1. Essentially, we get the benefit now, and future generations get both the security and energy expenditures. A drop to an EROI of 5 in today's American economy would mean that the energy sector of society would have to grow eightfold. If the drop came quickly, it would be very difficult to adapt. If the EROI were to drop to, say, 3, this would imply that potentially every third person would be involved in gathering energy in some fashion. Such a society would have little resemblence to the one we now inhabit. Some deep ecologists have suggested that agriculture was a fundamental mistake in human evolution and has created more ills than it purports to address. There is perhaps a larger group of people who believe that it was the discovery of fossil fuels and their contribution to the industrial revolution that constitute a critical wrong turn in human history. After all, the power which fossil fuels put in the hands of humans has enabled them to affect the ecosphere in profound ways that not only threaten the human future, but the future of every living thing on the planet. Then, there are those, probably an even larger group, that believe we have simply misused our technological prowess, and that if we could turn that prowess toward harmonizing ourselves with nature, we could preserve ourselves and our technical society while allowing nature to flourish once again. Embedded in each view is the assumption that somehow human society made a bad decision, perhaps even an immoral decision. It's hard for me to imagine that such "decisions" could have been averted or that such developments even fit the definition of the word "decision." For example, it's hard to imagine someone long ago "deciding" to plant seeds and tend to the resulting plants. It's easier to imagine that the connection was made between seeds and plants that sprouted from where those seeds had once lain. I can imagine experiments, halting at first, to test the theory that plants come from seeds. And finally, I can imagine attempts to sow seeds of favored food plants on plots near temporary seasonal encampments in order to provide food that would supplement sustenance obtained from traditional hunting and gathering. Likewise, the discovery and use of fossil fuels was not a "decision," but more likely perceived as an opportunity for energy gain. I am more inclined to the view that humans are like any organism and seek to maximize their energy gain for the purposes of survival and propagation. And, like other organisms humans can experience periods of riotous growth in their numbers followed by periods of decline and retrenchment. This "pulsing" is completely consistent with observed natural patterns. And, while we certainly should not abandon moral thinking, we need to be careful when we apply it to something as vast as the evolution of the human species. In saying this, I do not mean to minimize the human suffering that may be in store for us in a future that is energy-constrained--one in which fossil fuel supplies decline, but nothing of comparable scale takes their place. I am only trying to point out what Howard Odum suggests in his book, The Prosperous Way Down, namely, that human societies are not immune to the expansions and contractions which apply to other creatures. To be more precise, industrial civilization is not a path of continuous expansion, but simply a phase of expansion that will inevitably lead one day to a phase of contraction. To the extent that we can accept that industrial civilization is neither a mistake nor the highest and best arrangement of human affairs that will ever be, but rather has unfolded as one would expect through the interactions of social creatures who seek maximum energy, we can turn our energies to managing a transition to the next phase of civilization. There is considerable talk about creating sustainable societies, that is, societies that can last for an indefinite period without either exhausting their resources or fatally disturbing the natural processes upon which they depend. But if Odum is correct about the pulsing nature of complex systems, then we can expect to do no such thing. Instead, humans will be continually called upon to adapt to dynamic resizings of their scope during phases of both expansion and contraction. Often we confuse what is good with what is permanent. Permanence somehow conveys an innate moral rightness to us. But there are many things which we value which are inherently ephemeral--the bloom on a rose, the flight of a bird, the excitement of success, the exhilaration of falling in love. Do we value these things any less because they do not last? No, we value them all the more. But, we learn to go on to the next task in life, looking to meet our needs and attentive to the possibilities of pleasure and pain in every circumstance. If we could come to accept that our current industrial age is just a phase, ephemeral like all ages, neither a triumph which must be defended in its entirety at all costs, nor a mistake which must be allowed to collapse, nor a system that can be redeemed with just a few adjustments, we could learn to let go of it as it recedes without rejecting aspects of it that might prove to be instructive or useful. We could then move on to our next task, creating a new phase of human existence on planet Earth within limits we can no longer ignore.